I was going to begin my review by remarking that this creepy little book is the IN COLD BLOOD of this century, but a glance at the blurb shows me that the publisher thought of it first. THE MURDER FARM is a complete dissection of the events surrounding a murder, but is also a rhythmic, ritualised poem conveying the seething emotions involved. The plot is very simple, apparently is based on a true story (although this book is a fictionalised version of it). Old Danner, a farmer in a remote area of Germany, is murdered, together with his wife, his daughter Barbara, her two young children and the maid. Part of the book is written in narrative form, as a straight telling of the story; and part of it is a series of transcripts (in a different font) of "witness statements" by various neighbours, villagers and relations of the family and the maid to (presumably) the narrator who is trying to piece together what really happened. Through these statements, we absorb the atmosphere of the effects of the Second World War on this hard-working and somewhat impoverished community, the struggles to keep the farm going in an era where people were coming to terms with their defeat, and the mutual suspicions engendered by foreign workers. The reader is constantly unsettled by the shifting perspectives of the different witnesses, young or old, educated or ignorant, confident or hostile; gradually a picture emerges of Danner as a brutal man, harsh to his family and boasting about his hidden fortune while forcing them to work all hours of the day for little thanks and no luxuries. As the book progresses, hints and accusations coalesce into the true extent of his cruelty. Interspersed with the narrative and the statements are religious poems, or perhaps it would be more accurate to call them hymns, which shout from the page and add to the mounting unease. As the book nears its end, we learn that an itinerant criminal has previously learnt about Danner's stash of money and has decided to rob the family at night. He hides in the barn, and in the lead-up to the events of the final, awful night, the reader is constantly wrong-footed about the identity of the murderer. The book delivers a solution, both grisly and sad, though we don't learn why Danner became what he was. This bleak, short novel is one that will stick in your mind for a while, but there is little in it to smile about. 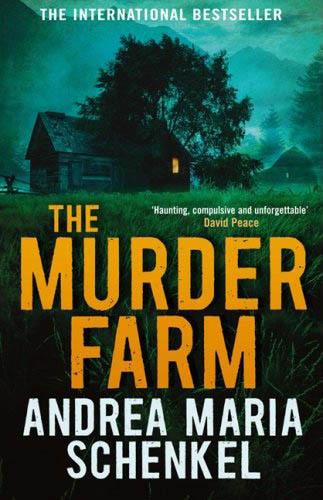 Read more reviews of THE MURDER FARM here and here.